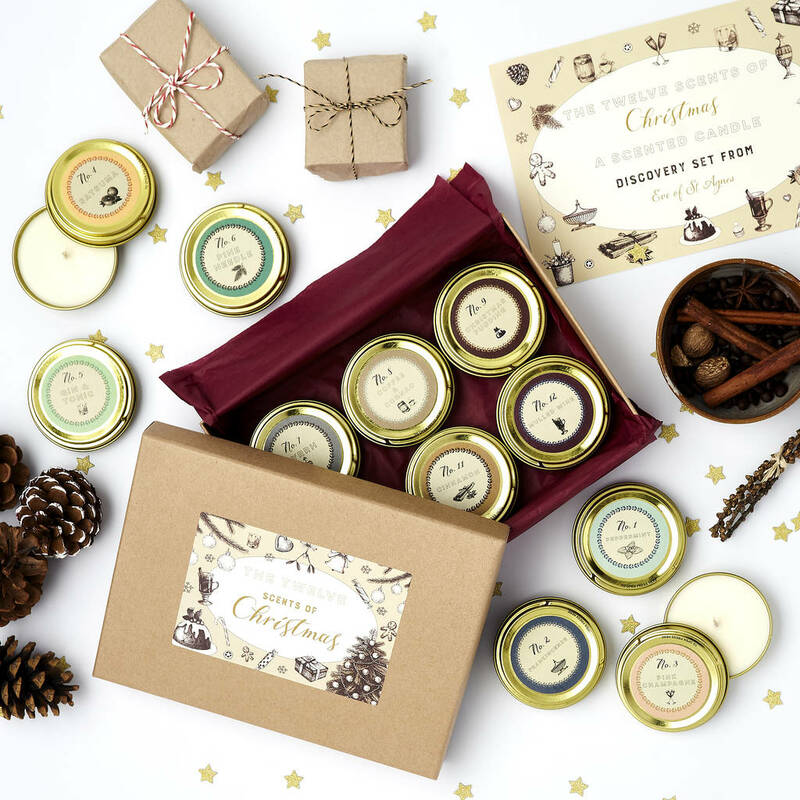 The perfect Christmas gift set for her featuring 12 Christmas scented candles, hand blended with twelve carefully selected Christmas fragrances, including Christmas pudding. Our Christmas scented candle gift set makes the perfect gift for her, for candle lovers and those seeking a truly unique gift. 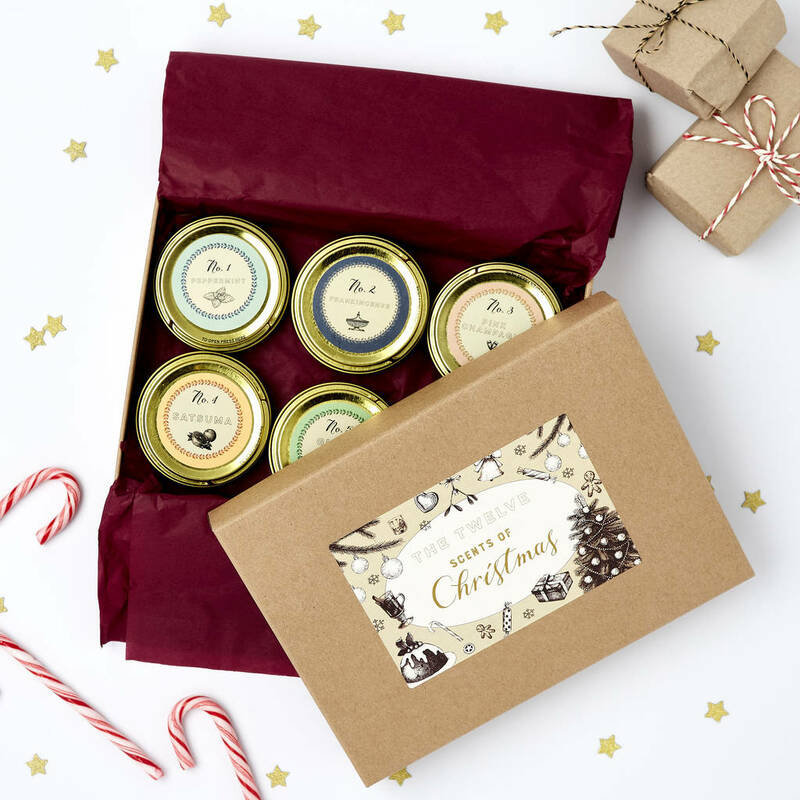 Each gift set contains travel sized candles with iconic Christmas fragrances such as Christmas pudding, mulled wine, pine needle, frankincense, myrrh and satsuma. Each candle is hand poured using pure soy wax. 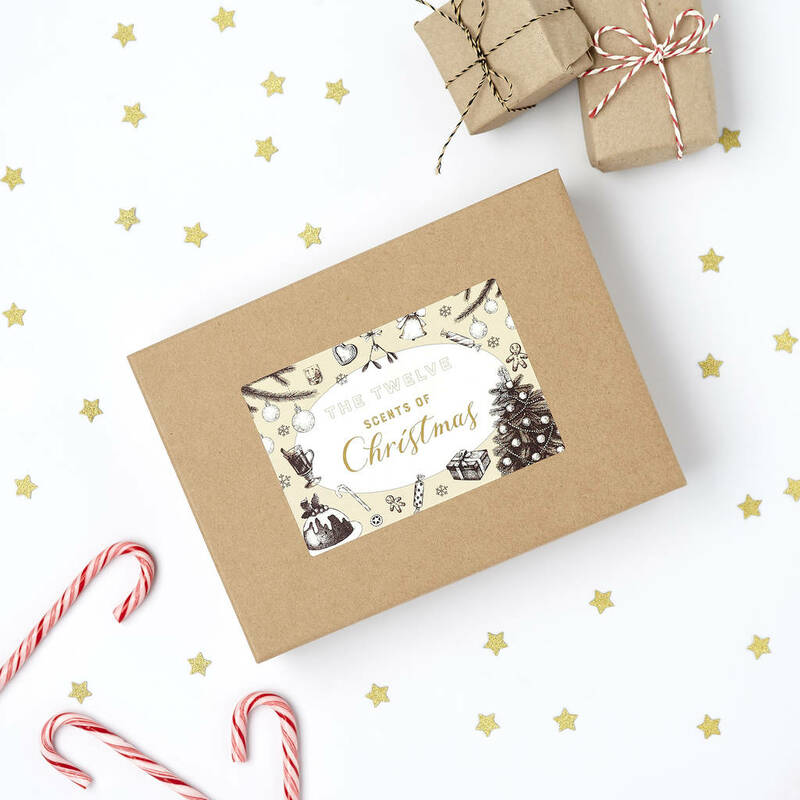 We can gift wrap your scented candle gift box for a small extra charge and include one of our luxury Christmas cards with your message. Each candle has a burn time of approximately 5-6 hours. 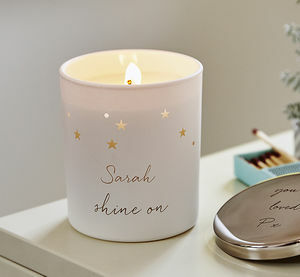 No.1 Is classic peppermint, the blend of pure peppermint oils epitomises the smell of peppermint candy canes on the tree. No. 2 is Frankincense, an elegant and traditional Christmas fragrance that is both smoky and slightly spicy. Our frankincense oil is blended with orange and benzoin oils to create a relaxing and soothing fragrance. No. 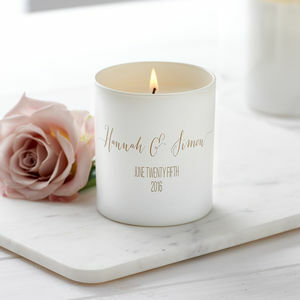 3 Is for those who like some bubbles over Christmas, the fresh aroma of pink grapefruit oil adds to the sweet and zesty scent of this Pink Champagne candle. No. 5 Is the much needed Gin & Tonic candle, a fabulous pick me up for boxing day and beyond, infused with pure juniper berry oil. No. 6 Christmas just wouldn't be Christmas without the fresh and comforting aroma of pine needles, our candle contains a blend of the finest pine needle essential oils. No.7 Is enigmatic Myrrh, an opulent oil with smokey notes, we have blended it with Sandalwood for a truly classic fragrance. No. 8 Brings to mind a relaxing end to a busy day, a touch of decadence can be found in this luxurious coffee and cognac candle, with a blend of pure roasted coffee oils and green cognac absolute. 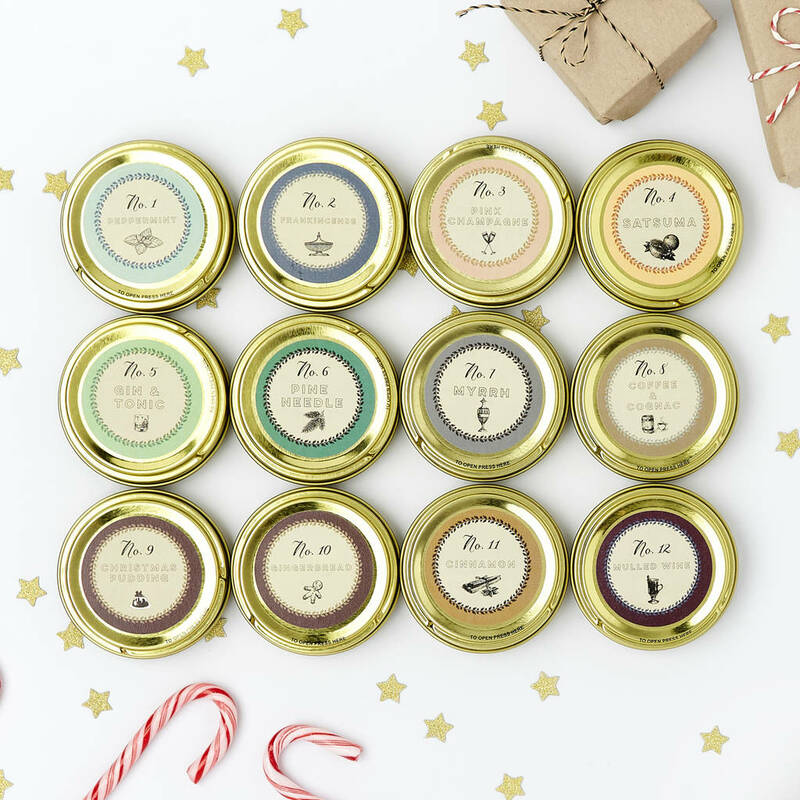 No.9 Bursting with ripe juicy fruits and more than a little swig of brandy, this Christmas pudding candle is sure to bring a warm glow to any house this season. No.10 Is another warming winter favourite - gingerbread. Whether it's making gingerbread men with the children, or a fine gingerbread house, this spicy iconic gingerbread candle includes a blend of pure gingerbread oil, with a touch of cinnamon and vanilla. No.11 Pure and unadulterated cinnamon, a spicy Christmas must-have fragrance. No.12 Our mulled wine candle will have you reaching for a glass. 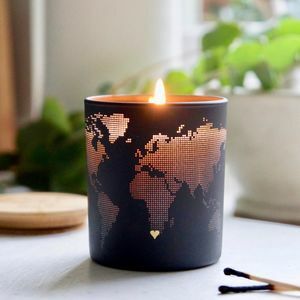 A treat for the senses, packed with blackcurrant oil, ginger, a little nutmeg and a hint of bay leaf, this candle is a sweet and spicy, fruity masterpiece! This year, give your true love these unique twelve iconic fragrances of Christmas. 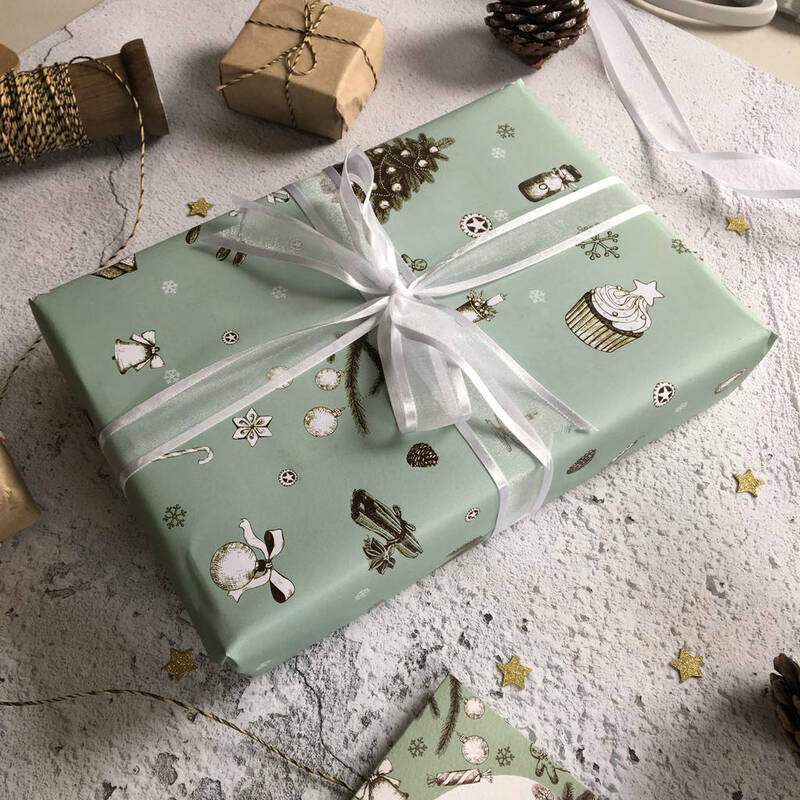 This Christmas gift box measures 170mm x 120mm x 55mm. Each candle measures 35mm x 45mm.